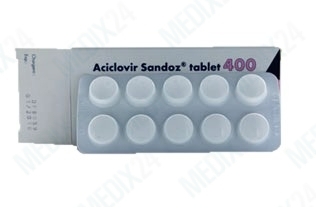 Aciclovir is an antiviral medicine which slows down the growth of certain viruses. Virus infections as herpes genitalis (genital herpes), herpes zoster virus (shingles) and the herpes simplex virus (cold sores) are treated with medicine. Used for treating: cold sores, shingles, chicken pox and genital herpes. Tablets: swallow with water, with or without food. 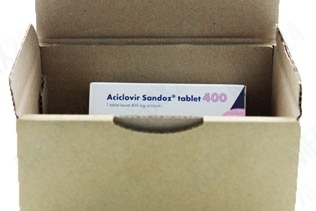 What is Aciclovir used for? Some herpes viruses in the human body can cause rashes or skin irritations. These symptoms indicate the existence of a virus in the body, for example the well-known cause of cold sores, the herpes simplex virus type 1. Diseases like the shingles and the chickenpox that are caused by “herpes zoster”, as well as genital herpes and herpes in the eye, are caused by viruses of the herpes group. Nine out of ten people who are infected have been infected with the viruses of the herpes simplex type since childhood. Unnoticed, the virus rests in the nerve cells of the human body only to appear in case of immune deficiencies in the form of skin blisters and severe itching and pain. The sores are highly infectious. Among the possible causes of the herpes infestation include stress, UV light, elevated body temperatures, diseases and also the phases of the menstrual period in female patients. Severe infection findings and patterns are possible when a rampant spread of the herpes virus in the body takes place. 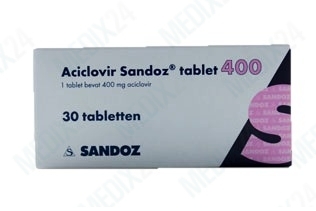 The multiplication of viruses in the body is prevented specifically by acyclovir. A complete termination of the pathogen is nearly impossible, but a duly usage of acyclovir effectively prevents an uncontrolled spread of the herpes virus in the body. The pharmaceutical form as a pill to be taken orally acts against the spread of the viruses very effectively. Can I use Aciclovir during pregnancy and lactation? During a pregnancy the drug should not be taken. Nursing mothers should not use acyclovir without the explicit approval of their GP. When you suffer from kidney dysfunction you may not use Aciclovir. During a concomitant gout prophylaxis with the drug probenecid a reduced excretion of acyclovir over the urinary passages is possible.